Walter Crane has become a big influence through my working with children's book illustration, where he explores other cultures and includes them in his illustrations, for example: his references to Greek Mythology and his heavy involvement in the Aesthetic Movement gives away symbols through the characters and scenery. One in particular is an illustration from Beauty and the Beast, produced in 1875, where the young woman's representation of beauty comes into play through the fan which, according to an art critic, has a symbolic meaning through Venus, the Roman goddess of love, who is also known as Aphrodite from Greek Mythology. 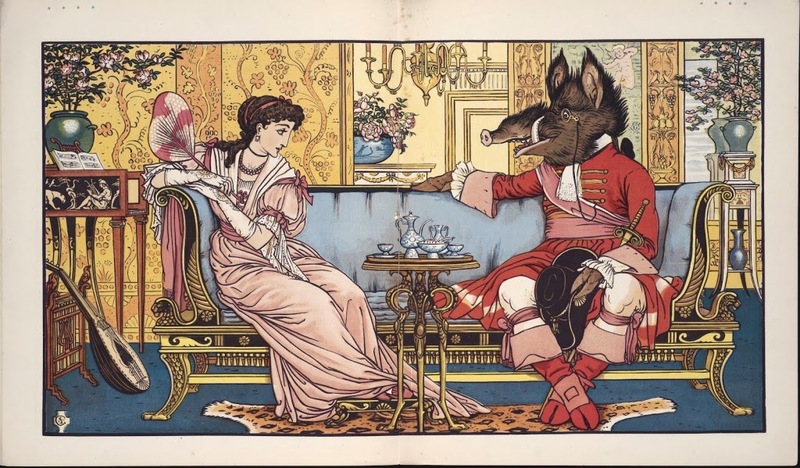 There is also the clothing on both her and the beast, where she is wearing a dress from the Ancient Greece fashion and the Beast is wearing a turkish old soldier uniform, and they are sat in front of a Victorian setting to keep Crane's influential references and involvement with Aestheticism.